Setting it Straight on Wind Energy | Broadview Collaborative, Inc.
Wind farms are a common sight here in Wisconsin, and Milwaukee recently landed a contract to manufacture wind turbine components, so I naturally thought my adopted state was a leader in wind energy. Wrong. Jeff Anthony of the American Wind Energy Association (AWEA) recently spoke to a packed house at Wingspread and set me straight. While the US is currently the lead nation in wind energy generation (with China predicted to surpass us shortly), Wisconsin sits in the middle of the pack for “installed capacity” relative to other U.S. states. The leading state is, not surprisingly, T. Boone Pickens’ home state of Texas. But I was surprised to learn that next in line is Iowa. Yes, Iowa. 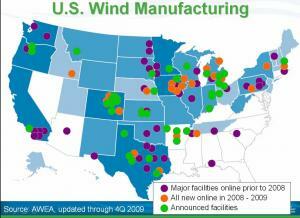 Iowa captures more wind energy than California! And if you think of it as a percent of the state’s total electric generation capacity, Iowais in a class all its own. According to Anthony, Iowagets 14.2% of its energy from wind. That’s still a long ways fromDenmark’s contribution (21%) but far ahead of the next state in line, Oregon, which comes in at 6.4%. And how much of Wisconsin’s energy comes from wind? A mere 0.66%. Yes, that decimal point is in the correct place. While there are many factors that contribute to this, Anthony claims that one of the reasons for our low showing is that Wisconsin has a reputation as a state where projects are likely to get blocked by local opposition. Who would have guessed? I take my hat off to Iowa, quietly doing its part for sustainability. I’ll think about that each day as I pass the train cars loaded with coal, on their way to our local power plant.